Finally! A delicious smoothie rich in flavor and low in carbs! Gluten free! The secret is using plain whole milk Greek yogurt, which is lower in carbs and higher in protein than regular plain yogurt. Mix together with our smoothie mix, cold water, heavy cream, vanilla and ice, and voila! A thick, decadently creamy chocolate smoothie perfect for a mid-afternoon snack or an after dinner treat! 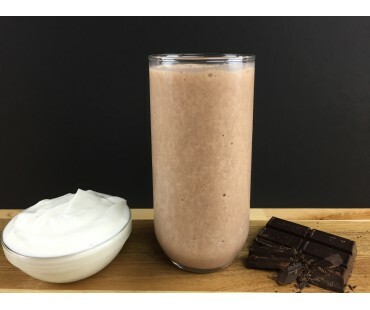 Our low carb smoothie mix is made of chia, whey protein, our all natural zero carb sweetener and premium Dutch cocoa, giving you a healthy dose of dietary fiber and protein in each scrumptious glass. Make it extra special by garnishing with some cocoa powder or unsweetened coconut. And be sure to use one of those big, thick straws so you can enjoy every last delicious drop! Very good chocolate shakes, and they are quite filling too! Delicious chocolate shakes! And they are quite filling. I ordered this several months ago and forgot I had it till last month. I have been on a low carb plan for about 18 months and had completely plateaued. I started drinking a shake every evening and now I am suddenly losing weight again. I add cocoa nibs and a scoop of fresh avocado and it's really yummy and tastes decadent. 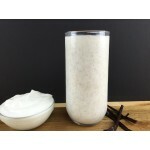 I think the reason I am losing weight now is the huge fiber content in each shake. It is super filling and I just love it. I put cacao nibs in this for some extra chocolate and added health benefits. Mmm! Very good! it made a nice thick chocolately shake.